Hushpuppy lives in “The Bathtub,” a small, forgotten, impoverished community in a mandatory evacuation area below a levee in southern Louisiana. 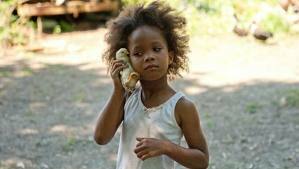 Hushpuppy is very independent for a five-year-old. Her mother left when she was very small; her father, Wink, looks after her, but Hushpuppy and Wink each live in their own homes. The citizens of The Bathtub love their home, but it’s threatened by flooding because of the levee. Wink damages the levee to protect The Bathtub, but his action alerts local authorities to the presence of people in the unsafe area. Residents are forcibly taken to a shelter in a safer area; while there, Wink learns that he is very sick. When they have an opportunity, many of the residents of The Bathtub return to their homes. There, Wink dies, and Hushpuppy stands together with the other citizens of The Bathtub, setting his funeral pyre afloat. What Does This Have To Do With Adoption? Lou Lumenick of The New York Post called “Beasts of the Southern Wild” a “challenging but hugely rewarding film.” Its relevance to adoption lies in the challenge. 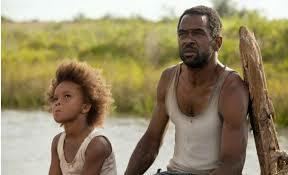 Hushpuppy, Wink, and the citizens of The Bathtub are happy in their lives. Their lives aren’t perfect, though: Wink is always drinking alcohol, and most social workers would probably report him as a negligent – and possibly abusive – parent. The home is in squalor, the education provided at the school seems suspect, the residents are deeply impoverished, and the town they live in isn’t really safe. But yet, for them, this is home. Outsiders who are better-off – in safer physical environment and with more resources, impose their help on residents of The Bathtub, but at the first opportunity, the residents of The Bathtub go back home. The outsiders didn’t understand the importance – or the value – of the community in The Bathtub. The difficult (but, rewarding) adoption connection is the point of view that this movie provides. Imposed help isn’t always welcome (and might not even be the best choice.) Adoptive parents and adoption professionals might not agree with the point-of-view this movie suggests, but would be prepared to show sensitivity by at least understanding it. From some points of view, many adoptions follow the pattern of imposed help. The child is growing up in (or is about to be born into) an environment that, from an outside point of view, seems underprivileged. In many international adoptions – but also in domestic adoptions – children are often adopted from impoverished families into well-to-do families, from unsafe neighborhoods into safer neighborhoods, and from less normative family circumstances into circumstances that are thought to be more “normal.” In “Beasts of the Southern Wild,” the help is forcibly imposed. That shouldn’t be the case in adoptions – but sadly, sometimes, it seems to be. Many birthmothers share their stories online of being coerced or emotionally pressured into relinquishing their babies. As a social worker, I’ve heard (not many, but not zero) adoption agencies express that they do put emotional pressure on birth parents to go through with relinquishments. Stories exist of children being unethically freed for international adoption. In the case of foster care adoption, the “help” is forcibly imposed. It’s not an easy connection to make, and it’s not an easy viewpoint for some to see. And it also doesn’t apply to every situation. The point of the movie isn’t, “imposed help is bad.” The point of this review isn’t “Adoption is bad.” Many birth parents enter willingly into adoption; the difficulty inherent in making an adoption plan isn’t in itself evidence of coercion or of a bad decision. As a former foster care social worker, I know that many times, children are brought out of horribly abusive situations and actively desire a safer, more stable family. Adoption isn’t bad. It can be a very positive thing. If your answer is, “Well, I really just want a child, so I don’t want to think about this” – then you’re probably not ready to approach adoption. Adoption should be driven by a child’s need for parents, rather than parents’ needs for a child. When you do work through those questions, you’ll be ready to be an ethical, child-centered, excellent parent. 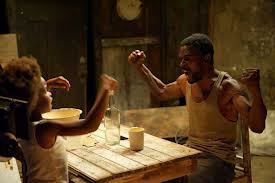 Beasts of the Southern Wild is very thought-provoking, and it shows that strengths exist alongside weaknesses. The movie is a bit heavy for most kids, who might see it as boring, confusing, or too frightening. It’s nearly a must-see for prospective adoptive parents and for adoption professionals. · How can you be sure your adoption is an ethical one? · Does the family from which you’re adopting need/want that form of help, or would they parent their child if a different form of help was extended to them? · If you were a social worker responding to a call about neglect, would you have taken Hushpuppy into foster care or recommended monitoring her but leaving her with Wink? Why? If you took her into foster care, what recommendations would you make for Wink in order for him to regain custody of Hushpuppy? · Would you be rooting for him to get his life in order and get her back, or would you expect that he couldn’t have anything more than a surface-level change, and hope that Hushpuppy would be quickly adopted from foster care? · How do you see this movie relating to your adoption story? - Too Old for Adoption? - Too Single for Adoption? You might also want to follow Adoption at the Movies onFacebook. I just scanned the synopsis because I haven't seen the movie yet (but very much want to). I think the link to imposed help and ethics of the helpers is a good one to make and examine. Oh Lori, this is such a powerful and good movie. I'm so excited to know what you think of it once you see it! this movie slayed me. or rather the actress who played hush puppy did. such a fascinating perspective, from the social worker POV about this incredibly insular and impoverished community. the issue of forced help and ethics is really interesting. thanks for posting this one! Thanks, Luna. They're hard questions to ask, but they're good ones and necessary ones if we're going to be the ethical adopters / adoption professionals that we want to be. I was just talking with Rebecca Hawkes on Twitter, thinking about how sometimes the "help" we offer is kind of like surgery. It might be necessary, but maybe something less extreme would have worked. Great movie. What a great piece you have written...as an adoptee and also an adoptive mother you have raised wonderful, thought-provoking questions. I hope people want their thoughts provoked...this is all so important! Julie, thanks so much for your kind words. I'm glad that this piece connected with you. 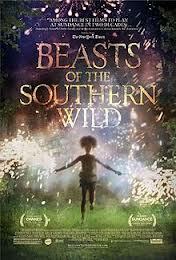 I was surprised how much Beasts of the Southern Wild connected with me. God bless you! I'm glad you're here! Though I've not seen the movie, I saw the obvious links between adoption and the movie though the movie didn't talk about adoption specifically. I guess I shouldn't say "obvious links" as I come from a highly biased point of view. However, I also love the discussion inspired by this post, and the fact that you say not all adoption is bad. I agree with that point. It's difficult for me to talk about the negatives in adoption as often as I do without seeming like I'm against all adoption or anything that removes a child from biological family. Thanks, Monika. Your comment means so much. I think the pulse of the online adoption community at large would probably say, "adoption has difficulties which are experienced by all sides, but it has the potential to be a positive thing for all sides." What do you think? I think you need to define "financial support." It has been my experience that lack of money is not the only problem in a person's life. Rather, it is a symptom of other problems. Usually, that problem is a lack of education, but there can be other factors as well. When I see "financial support" it reminds me of the adoption critics who say, "Why didn't you just give $25,000 to the kid's birth mother? Then she could have kept the kid." That's a question I keep meaning to address on my blog. I think it's a fallacy. What happens when the money runs out? Because it will run out. As I said, lack of money is a symptom of a larger problem. You have to address the root of the problem, not just throw money at it. I haven't seen this movie, but I very much want to. Hi Robyn! Thanks so much for your comment. I think that this movie does a pretty good job of raising a similar question to the one that your comment raises. The professionals who took Hushpuppy and her neighbors away from The Bathtub were over-helping; they were coming from a position which basically said, "because we're in a better environment than you, we'll dictate what happens to you." It's an attitude that touches adoption - sometimes but not always. In foster care adoption, some of the removals (many, most?) were necessary, but some probably were the result of cultural bias. I've met with some agencies that fairly overtly said that if a pregnant woman was considering adoption, she should go through with it because her life obviously wasn't in good enough order to parent. Recently, Rebecca Hawkes (an excellent adoption blogger) shared with me about Georgia Tann, who was able to use unethical practices in the 1950's based on thoughts quite similar to those shown in Beasts of the Southern Wild. I don't think that those thoughts are the most predominant ones in the adoption community. I think most agencies and most adopters approach adoption from a healthier point of view. The question that the movie raised for me was, "what's the best response?" It varies from situation to situation. You're right - a lack of money is usually a symptom of other problems. So, what's the best solution? In some cases, it probably would be embracing the pregnant woman with financial support, access to education, maybe parenting preparation classes, and whatever else she needs. In other cases, adoption is the better choice. But yeah, the "why didn't you just give $25,000 to the family" question overlooks quite a lot. I'm really glad you commented; I'd love to hear more of your thoughts!